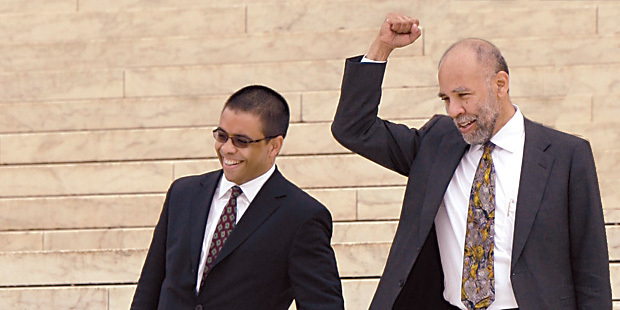 When Debo Adegbile ’94 (above left) appeared before the Supreme Court in April to argue against a constitutional challenge to Section 5 of the Voting Rights Act of 1965, it was the climax of several years’ effort to win congressional reauthorization of provisions of the VRA. Adegbile, director of litigation at the NAACP Legal Defense and Educational Fund, had testified in both the House and Senate and made appearances across the country to educate the public and engage in debate about VRA issues. On the surface, the case was a simple one. A small Texas utility district with an elected board wanted the opportunity to “bail out” of its obligations under Section 5, which requires that certain local jurisdictions with a history of voting rights discrimination seek Justice Department preapproval before changing their voting procedures. Since the district does not register voters, it was deemed ineligible to bail out, and so brought suit to win that right or, alternatively, to overturn Section 5 entirely. The latter possibility made Northwest Austin Municipal Utility District Number One v. Holder the most highly anticipated opinion of the last term. The tone of the oral argument on April 29 led most observers to believe the Supreme Court might declare Section 5 unconstitutional. Adegbile faced skeptical questioning from several justices; one of the most prominently raised questions was whether the mix of covered jurisdictions was now outdated. Many legal analysts predicted a 5-4 decision. The Court surprised both sides on June 22 when it ruled 8-1 to address the case narrowly, leaving Section 5 intact. The Court gave non–voter-registering entities the right to seek bailout relief, but also implied that Section 5’s constitutional status might be under threat.